For fun last week I gave The Bonefish Flat state of the union, but the real truth is that we need to know more about the real state of the bonefish, tarpon, permit and all the other fish that swim the flats. If you caught my interview with Dr. Aaron Adams a few months back, you know that much more work needs to be done to research these great fish. That's why it's important to join the Bonefish and Tarpon Trust. You'll help fund critical bonefish, tarpon, and permit research to help us learn more so we can protect these fish. To sweeten the deal, BTT is offering a free monthly give away. This month it's from Howler Brothers. Now, you can join at the $50 level and get cool prizes including a chance to win a grand prize of a 3 day trip to the Ascension Bay Bonefish Club. 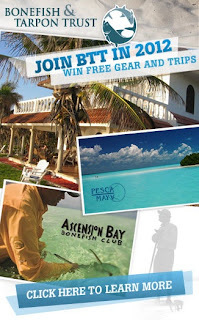 Renew or join at the $100 level and get a chance for a 6 day 7 night adventure to Pesca Maya Bonefish Lodge. I was looking through some old pictures last night and thought it would be a shame if my daughter and son never had a chance to catch a bonefish. Let's join BTT and make sure the fish of the flats are around for the next generation. 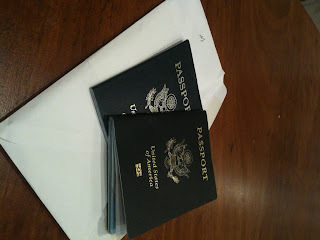 One of the things I needed to do in preparation of my upcoming trip was to get my passport renewed. Every 10 years, whether it needs or not, it's time to renew. It's fun to look back at the places you've been, and dream about the places you'll go. I've had some fun adventures in my last passport, with stamps from Australia, France, the Netherlands, the Bahamas, Iceland, New Zealand and England. Some were for fly fishing, but most were just me getting out to see the world. And hopefully I'm just getting started. There's lots to see and many fish to catch. Now, I've got a clean slate. A new book to fill and new adventures to be had. I'm gearing up for a trip to Long Island, Bahamas and will start putting together a travel series to update everyone on how I get ready for a trip. Until then, check your passport and make sure it's up-to-date. You never know when the Bonefish Flat's will be calling!! I thought it might be good, coming to you from the nation's Capitol, to give the state of The Bonefish Flat. The state of the flat is good my friends. I have two trips planned for the first half of this year. It looks like I'm headed to Long Island, Bahamas in March. This will be my first trip to the Out Islands and I'm really looking forward to the experience. Part of the fun of any trip is the preparation, and I'm in the process of updating my flybox a bit now. If you have a killer pattern for Long Island, email me and let me know and I'll tie it up. These are my three bonefish fly boxes. My general bonefishing flies. Charlies, puffs, etc. 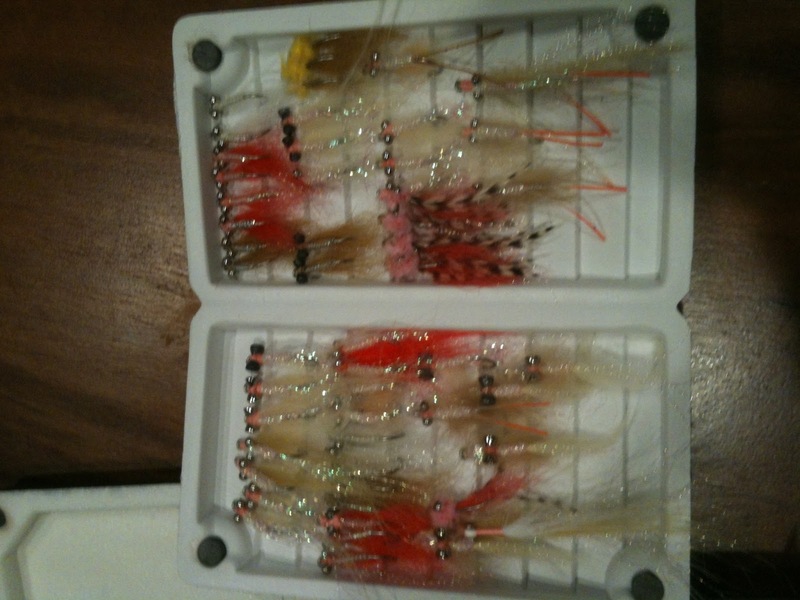 I may do another bonefish travel series to show how I prepare for this trip. You might have seen my travel check list the other day which I have under a new tab here. 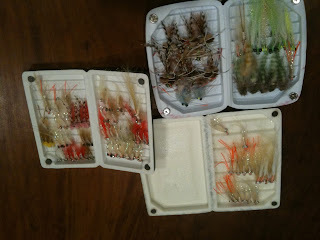 I will need to pack lighter but at the same time take everything I need for a week's worth of fishing. In July, I'm looking to head toward the keys and land a late season tarpon. More on that trip to come. Finally, I still need to land that redfish from 2011, so I'll be looking to sneak that in during the second half of the year. The Bonefish Flat is headed in the right direction. 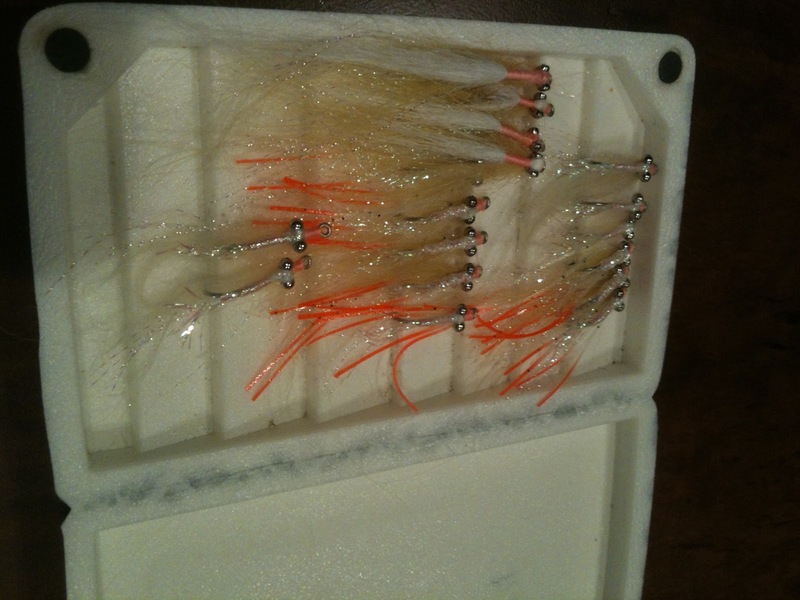 We are going to tie more flies, catch more fish, and spend more time on the water. Thanks for reading, and may God Bless America!! A couple of quick updates for the Bonefish Flat. First, I just hit 100 likes on Facebook so thanks very much for following the site on the old Facebook. I've got some new things planned for this year and so the site has lots to look forward to. I've also added two pages to the blog that you will see at the top. The first is a tab which contains trip reports. Hopefully we will add a few to that one this year!! Here's a bone I caught a few years back with Capt. Bully. The second tab I added is my gear checklist that I use for trips. I'm always interested in knowing what other gear anglers are using so I thought I would share what I take along when on a trip. If you have any feedback, please leave it or feel free to write me at bonefishflat@gmail.com. I'm always looking for ways to improve the site. 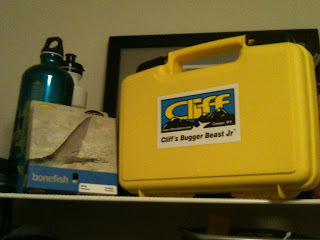 Really excited to try out my new Cliff Bugger Box Jr. and my new Rio Bonefish Fly Line. I've noticed you see a lot of guides using the bugger box. Everyone from the guys on drift boats to Florida Keys guides seem to be using these things. I can't wait to load it up with some Bonefish and Tarpon flies. 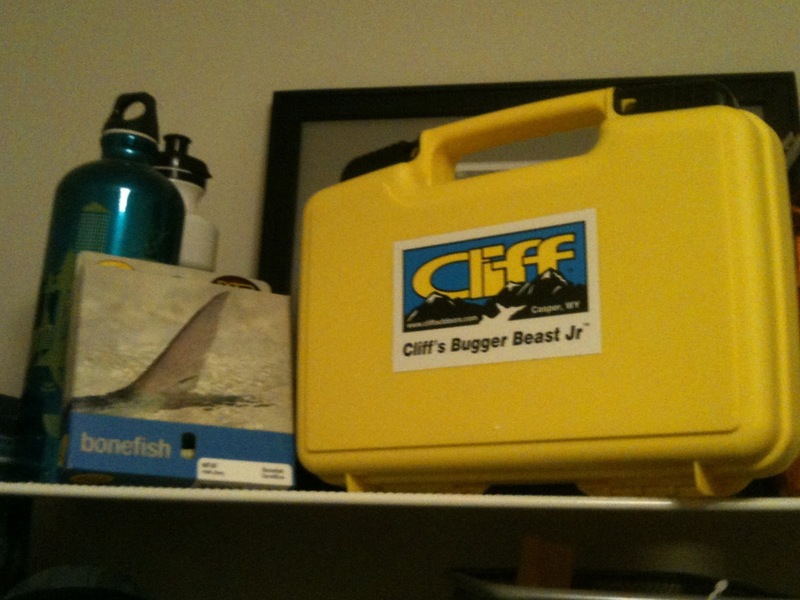 The Cliff Bugger and the Rio Bonefish line in the Bonefish Flat HQ. I'm also switching over from the SA Mastery Bonefish line to the Rio Bonefish line. Why? It's just time to try something different. SA seems to be headed in the direction of the textured line and I hear mixed reviews on that line. I haven't tried it out yet so I can't say for sure. I like the color and look of Rio and what they've put together. More to come on the new line. Well, 2011 has come and gone. I tried to spare everyone a recap and a "look forward" addition of the Bonefish Flat because I know that was the talk of the web right after the New Year. But alas, it's good for the soul to reflect on the year gone by and what lies ahead. To put it simply, 2011 was not real fishy. Seemed like mostly a lot of work. The Mrs. and I bought a new house and that seemed to take up most of the year. As a result, my yearly bonefishing trip got put off. You don't realize how much you miss bonefishing until you don't get to go (OK, maybe you do. Maybe we think about it all the time, but that's one for another blog post). You might remember that I declared 2011 the year of the redfish. Unfortunately, I never got my redfish to hand but that will change. Maybe even this year. My one trip was to the outer banks of North Carolina and apparently there are no redfish there. There may be no fish there, at least none that were eating my flies. I had a good time nonetheless hanging out and spending time with my dad. Should be Red's in there, right? Wrong. Pops and I at the OBX. I did spend some time around the holidays and got into some trout fishing and some fishing the Chesapeake Bay. I managed to land a Thanksgiving trout on the famous Gunpowder River of Maryland, and that was a good thing. The bay "was angry that day, my friend" and we didn't land any fish. But it's always good to get out on the water. The target ship in the bay. So what does 2012 have in store for the Bonefish Flat? 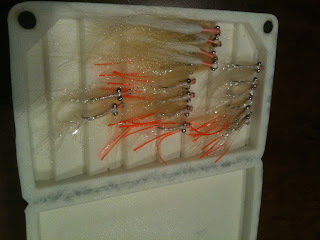 I have a trip planned to the Keys for Tarpon and whatever else is biting down there. So am I ready to declare 2012 the year of the Tarpon? That didn't work so well with the redfish, so let's just all say that 2012 is the year of the fish, and let's all try to find our way out on the water for a few more trips and a few more trips. I'm also working on a special mystery trip that hopefully will come together soon, so be sure to stay tuned for more on that. Other than that, I will try to put together another trip down south for redfish with my trusty old kayak. That might have to wait until later in the year.